merit in written exam only. For fireman posts physical tests will be conducted along with Exam. Online applications only accepted for this HQ Southern Command Pune Vacancies. Online form will be accepted through official website of www.aocrecruitment.gov.in. Online applications will be accepted from the 5th day of notification given in employment news. Last date for online application form submission @aocrecruitment.gov.in website is 21 days from the online activation date. 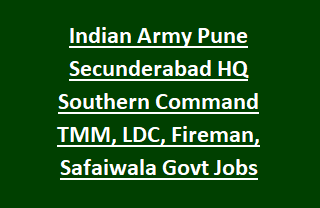 For more information about this Pune/Secunderabad AOC Center HQ Southern Command TMM, LDC, Fireman, Safaiwala Govt Jobs recruitment exam notification available vacancies, exam pattern and other details are given below. Last date for applying online is 21 days from the link activation @www.aocrecruitment.in. There are total 818 vacancies in this recruitment of Southern Commands of Indian Army AOC centers Pune and Secunderabad. Carpenter & Joiner: 03 Posts. Lower Division Clerk: 110 Posts. Painter & Decorator: 01 Post. Steno Grade II: 02 Posts. Tin & Copper Smith: 01 Post. Candidates must have qualified 10th class/SSC. For Lower Divisional Clerk posts Inter or 10+2 qualification required. For Material Assistant jobs Degree qualification required. Age limits are 18-28 years for all the posts. Candidates will be selected through written exam only. For fireman pots written test and physical tests will conducted. Based on received application online candidates will be short listed and those candidates only called for written test. Objective type written test will be conducted for 100 marks. It covers the topics of General English, General Intelligence & reasoning, General Awareness and Numerical Aptitude. Syllabus will be SSC/10th class level only. 1.6 km Running to be completed in 6 minutes. Interested candidates may apply online for this HQ Southern Command Pune/Secunderabad AOC Centers vacancies on or before 21 days from the link activated in www.aocrecrutiment.in. Fill the complete details at the time of online application form. Admit card for written exam will be available in the same website.